The typical meat and fish dishes of the Azorean cuisine are also present in São Jorge. It has exclusive rights, however, to the fleshy cockles that are caught in the waters of the lake called Caldeira de Santo Cristo. There is also a large variety of sweets with names such as coscorões, rosquilhas de aguardente, espécies, suspiros, esquecidos, bolo de véspera, cavacas, bolo de coalhada and doce branco. The green grass of the fields is transformed into milk in the udders of the local cows. 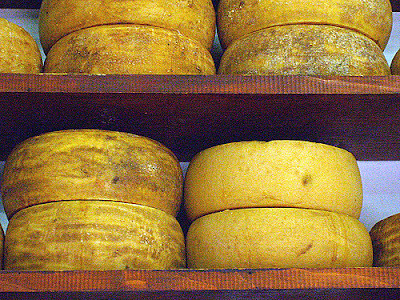 And from it are produced creamy, straw-coloured cheeses that have the size of wheels and weigh from 7 to 12 kilos. Cured for several months in rooms where a constant temperature is maintained, the cheese acquires a honey coloured rind. Afterwards, it is exported to various countries, where it is appreciated for the piquant flavour it acquires with time... and which makes it a delicious appetiser.